Rarely have we received reviews sent in during a webinar. The Innovation webinar was an exception! 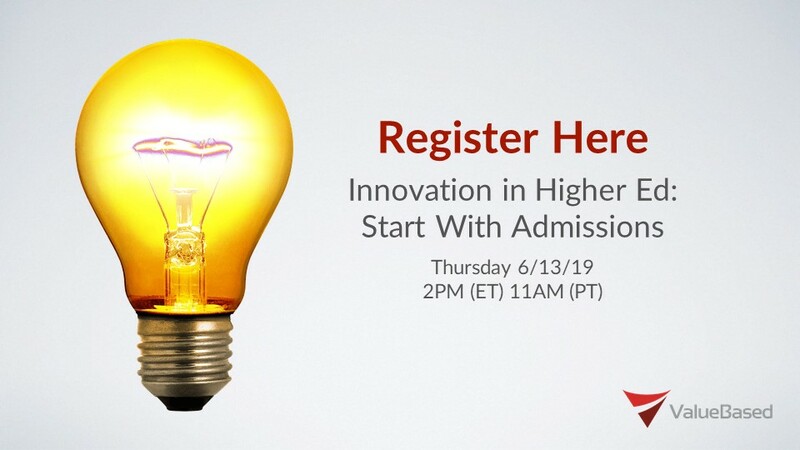 So back by popular demand, is this live encore presentation of last month's webinar titled: Innovation in Higher Ed: Start with Admissions. Join us on Thursday, May 31st at 2PM (ET)/11AM (PT) when Rob Westervelt, EVP of Innovation and Empowerment & former EVP of Marketing & Enrollment at George Fox University (GFU), and Jim Allen, Founder/Principal of Value Based, will team up to present how innovation within the GFU Admissions Department has led to five consecutive record Freshman classes since 2012. Our newest upcoming webinar is titled: Settling the Debate on College Marketing: Why Centralized Marketing Under the Chief Enrollment Officer Increases Enrollments. Rob Westervelt, Vice President of Enrollment and Marketing at George Fox University will be the featured speaker. Under his leadership George Fox has recorded 4 consecutive record Freshman classes since 2013.